Large sections of North Carolina were settled by Scots in the 18th and 19th centuries. Both my wife and I claim descent from Scottish families. I have been told that there are more people in North Carolina of Scottish descent than there are in Scotland. Whether that is true or not, I do not know, but in recent years there has been a surge in the Scot culture in this state, and elsewhere. Many highland games are held each year throughout the country featuring highland garb and food, bagpipe bands, heavy highland athletics and dancing, with the largest being the annual highland games at Grandfather Mountain in Linville, North Carolina. Both of my sons have participated in these games over the years, my son Tristan as a piper and my son Devin as a flourishing tenor drummer. There are a couple of pipe bands active in the Greensboro area, The Jamestown Pipes and Drums and the Deep River Pipes and Drums. 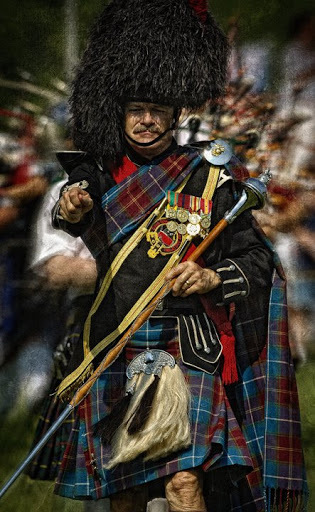 The photograph above is of a drum major from the Triad Highland Games, held annually in Greensboro.